@AlexRozierK5/TwitterAlex Rozier, a reporter for the NBC affiliate KING 5 News. A local reporter in Washington state captured video aboard the Amtrak 501 train about 10 minutes before it derailed Monday morning, killing at least three people. 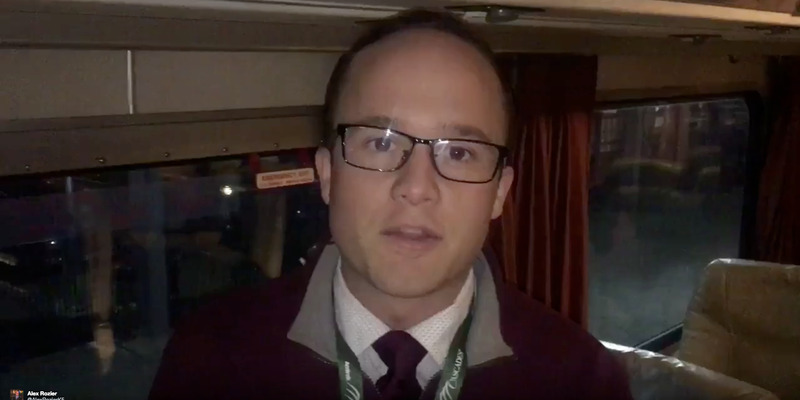 A reporter for the local NBC affiliate KING 5 News captured video footage aboard the Amtrak train that derailed in DuPont, Washington, on Monday. In the video, Rozier is seen on the train that eventually derailed at about 7:40 a.m. local time. The crash killed at least three people and sent at least 100 people to the hospital, according to the Associated Press. “Smooth ride,” the photographer replied. “TV news crews often get pulled from one story to go to the next breaker. This time it may have saved @AlexRozierK5 and @King5unit9’s lives,” another KING 5 News reporter, Elisa Hahn,tweeted. The train was making its first trip on a new route in which it was to leave Seattle at 6 a.m. for a journey of about 3 1/2 hours to Portland, Oregon, the Associated Press said. It was the first time the public used a new bypass built on an existing rail line along the highway from Tacoma, Washington, to DuPont, near where the train derailed. Seventy-seven passengers and seven crew members were aboard the train when it derailed, pulling 13 cars from the tracks. National Transportation Safety Board investigators were examining the scene to determine the cause.